How Tall is That Gantry? This article was originally posted on Arms Control Wonk. 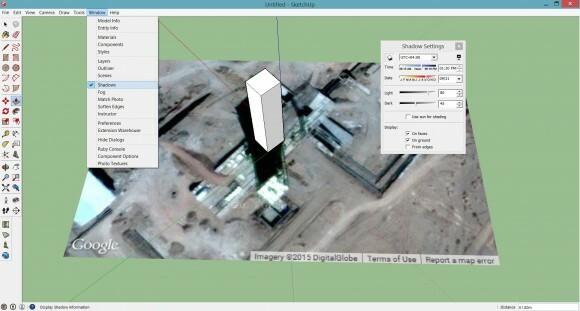 A little how-to guide to measure the height of any most structures on Google Earth. As you click through the Twittersphere or even click through TV channels (remember those? 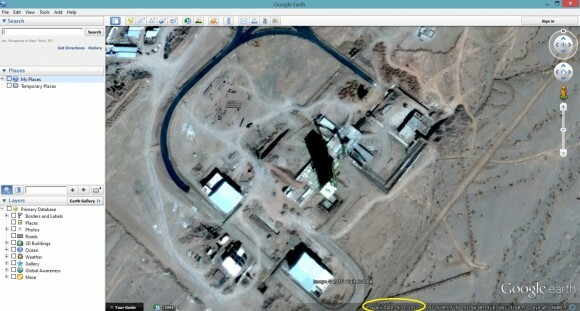 ), you may hear claims like “North Korea is building a scary big missile” or “Iran’s building a scary big elevator shaft.” Ok, I made that last one up. But how do we know? Well, they haven’t shown off their new missiles. Yet. But, they are building some mighty big gantry towers. How big you say? Let me show you. Better yet, let me show you how to do it yourself. 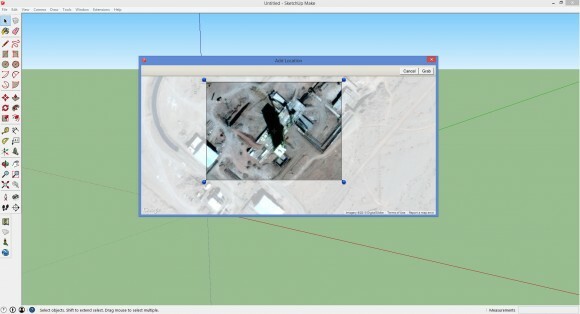 Download (FREE) SketchUp Make, and (FREE) Google Earth Pro. Set up SketchUp, preferably using a template in meters (because they are better). Activate the Large Tool Set and Google tool bars under the View menu. 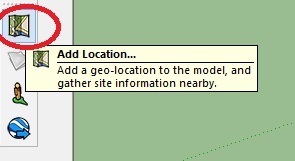 Click Add Location on the Google tool bar. Type in the coordinates: 35.236390° 53.950016° and click Select Region on the top right. Drag the pins to select the territory around the gantry tower. Make sure you include the entire shadow. When ready, hit Grab and give your computer a second to import the image into SketchUp. Now you have an image along your red and green axes and the blue represents the vertical space. First, reset your axes to the corner of the tower, and then draw a rectangle around the base. This is might hurt your eyes a bit. Zoom in and out until you can see where the shadow joins the structure. Now use the Push Pull tool to make your 2D rectangle into a 3D tower (my favorite part). For now, just make a guess at how tall the tower is. Next, go to the View menu and click shadows. 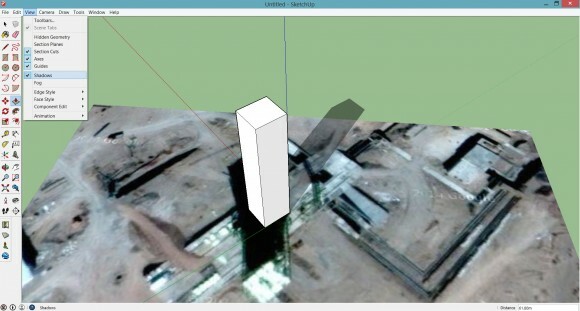 Very obviously, the shadow generated by SketchUp does not match the one in the imagery. How to rectify? Well, go back to Google Earth and see when the image was taken. SketchUp is just pulling the API from Google. It’s on the bottom right of the window. Now go back to SketchUp and select Shadows from the Windows menu. Enter 09/21. The shadows most likely still don’t line up, because we don’t have the right time of day yet. 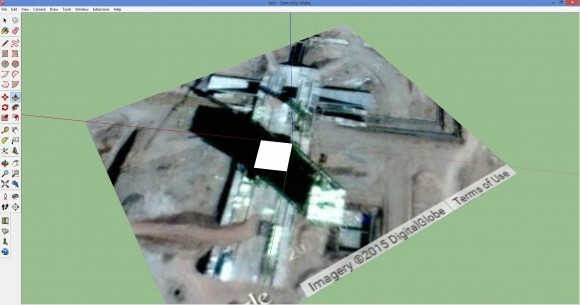 Unfortunately, Google Earth doesn’t tell you what time the image was taken. You can (and I have, ugh) looked through the DigitalGlobe catalog until you find it, but we can get pretty close without it. Grab the slider bar and adjust it until the SketchUp-generated shadow lines up with the imagery shadow. 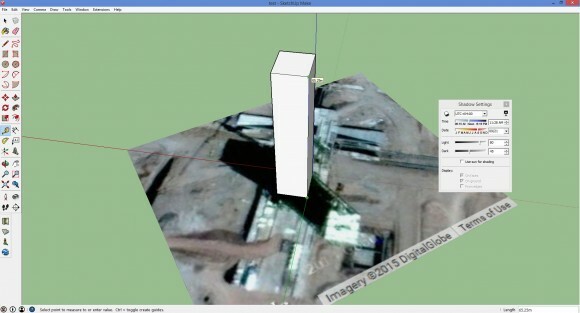 It doesn’t have to be the right height, but your SketchUp shadow should be the same shape and the “width” of the shadow on the satellite image. If not, you might have to check your work in Step 5. Ok, so now we adjust the height of our tower to make sure that the shadows line up. And, Voila! Grab a tape measure and see how tall that baby is. In this case, our measurement shows ~45 meters. Keep in mind that the tower is on top of a pad which is also elevated (see its shadow? ), so to be more accurate you should build it too. BEFORE the haters show up — a couple of notes: crowded structures, uneven terrain, and poor resolution will make your job harder and introduce error. So, maybe don’t try to build a model of something right next to a cliff. You can play with the terrain function on the Google toolbar, sometimes it helps, sometimes it’s FUBAR. You can also build all the other structure which will receive and generate their own shadows. Have at it! You can make it as realistic as you want. See that crane in the shadow? You can build it too. Special thanks to Frank Pabian who showed me this neat trick! Melissa Hanham is a Senior Research Associate at the James Martin Center for Nonproliferation Studies (CNS). She supports CNS' research by investigating new techniques in open source analysis; incorporating imagery, remote sensing data, large data sets, 3D modeling, and other GIS data fusion. She is a regular contributor to the Arms Control Wonk blog, and co-teaches "Open Source Analysis for Nonproliferation and Terrorism Studies" and "Geospatial Tools for Nonproliferation Analysis" at the Middlebury Institute of International Studies.